290 Commonwealth is located on the south side of Commonwealth, between Gloucester and Hereford, with 288 Commonwealth to the east and 294 Commonwealth to the west. 290 Commonwealth was designed and built in 1890-1891 by architect and building contractor Frederick B. Pope. as a six unit apartment house, with one flat on each floor. Fred Pope is shown as the owner, architect, and builder on the original building permit application, dated May 27, 1890, and on the final building inspection report, dated October 24, 1891. 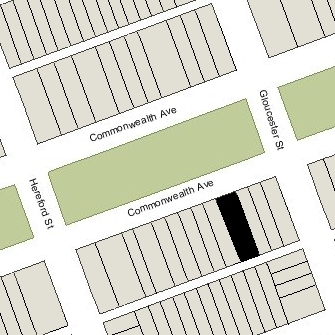 On both documents, the property is identified as 292 Commonwealth. At the time construction of 290 Commonwealth began, the land was owned by Susan (Keller) Pope, the widow of William Henry Pope of East Machias, Maine, and their daughter, Julia Antoinette (Pope) Furber, the wife of Thomas Franklin Furber, of Boston, in their capacity as executors of William H. Pope’s will. They had acquired the land on July 8, 1878, from William H. Pope’s brother, Edwin Pope, a leather dealer in Boston, receiving it as partial payment of a claim owed by Edwin Pope to William H. Pope’s estate. Edwin and William Pope were the sons of William Pope of East Machias, Maine; they were not closely related to Frederick Pope, who was born in Walpole, New Hampshire, the son of Samuel Pope. Edwin Pope had acquired the land on October 21, 1878, from Albert J. Fernald. The lot was part of a tract of land originally purchased by Nathan Matthews on January 2, 1871, from David Sears, Jr., Frederick R. Sears, and Knyvet Sears. On September 1, 1890, the land was purchased from Susan Pope and Julia Furber by wholesale coal merchant George Wayland, and on September 4, 1890, it was acquired from him by Frederick Pope. Click here for an index to the deeds for 290 Commonwealth. On January 20, 1891, as the building was nearing completion, 290 Commonwealth was purchased from Frederick Pope by real estate developer and investor Albert Geiger. On March 26, 1891, he sold the property to iron and steel merchant Barthold Schlesinger, who bought it as an investment. He and his wife, Mary (McBurney) Schlesinger, lived in Brookline. 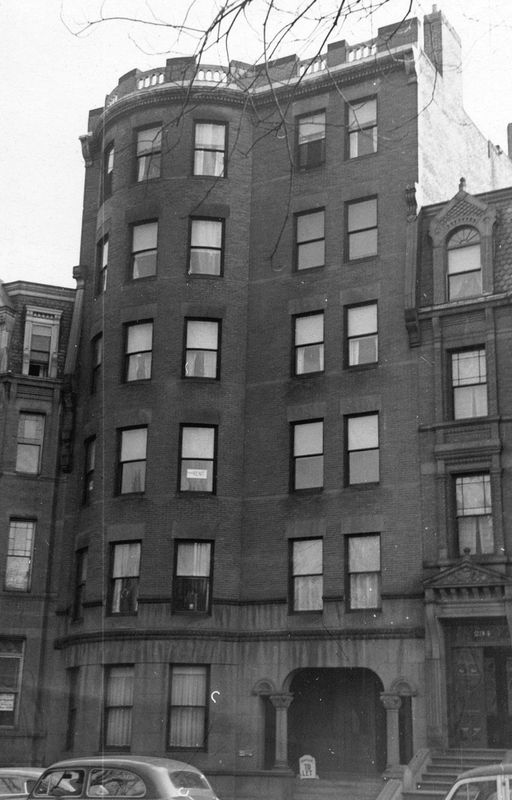 Albert Geiger and Barthold Schlesinger were associated n several apartment building projects in the Back Bay. In November of 1890, Albert Geiger had purchased 293-295 Commonwealth while they were still under construction and in May of 1891 had sold both buildings to Barthold Schlesinger. In the spring of 1892, Albert Geiger began construction of two buildings at 220 Marlborough and 222-224 Marlborough, and sold both in November of 1892 to Barthold Schlesinger. 290 Commonwealth was completed in 1891 and had been occupied by the 1891-1892 winter season. Albert Geiger and his wife, Emma (Pfyffer) Geiger lived in one of the apartments at 290 Commonwealth. They previously had lived at 704 Huntington. They continued to live at 290 Commonwealth during the 1892-1893 season, but moved thereafter to an apartment in The Chesterfield at 371 Commonwealth. Also among the first residents at 290 Commonwealth were Ralph Huntington White and his wife, Ellen Maria (Tucker) White. He was founder and president of the R. H. White Company department store. They previously had lived at the Hotel Victoria at 273 Dartmouth. Ellen White died in November of 1897, and he remarried in October of 1899 to Lena Elizabeth Hubbard. They continued to live at 290 Commonwealth during the 1913-1914 winter season, but moved thereafter to Chestnut Hill. They also maintained an apartment at 56 Fenway. On January 26, 1894, Albert Geiger acquired 290 Commonwealth back from Barthold Scheslinger. Louis Wyman was president and treasurer of the Wright & Potter Printing Company, the Massachusetts state printers. He and his wife, Edith Estelle (Merriam) Wyman, lived in Swampscott. On May 26, 1894, Louis Wyman transferred 290 Commonwealth to Theodore and Jane Dodge’s three surviving children: Robert, Theodora, and Jane (Emily Dodge had died in April of 1883). On June 6, 1894, the three siblings transferred the property back to Louis Wyman as trustee on their behalf. On February 16, 1917, Louis Wyman transferred the property back Robert, Theodora, and Jane Dodge. At that time, Robert Dodge was a professor of English at the University of Wisconsin. He and his wife, Katherine Eleanor (Staley) Dodge, lived in Madison, Wisconsin. Theodora Dodge and Jane Dodge were living in London. On November 30, 1923, 290 Commonwealth was acquired from Robert, Theodora, and Jane Dodge by Louis Wyman’s son, Arthur Merriam Wyman, and John T. Hosford. Arthur Wyman had succeeded his father was treasurer of the Wright & Potter Printing Company (Louis Wyman had died in July of 1917), and John Hosford was a real estate dealer. On August 13, 1938, Arthur Wyman acquired John Hosford’s interest in the property. On November 25, 1946, 290 Commonwealth was acquired from Arthur Wyman by Byron R. Switzer, Janet Cary Allmon, and Francis H. Farrell, trustees of the Commonwealth-Newbury Mortgage and Real Estate Trust. In April of 1946, prior to taking title to the property, the trust had filed for (and subsequently received) permission to remodel the building and increase the number of apartments from six units (one per floor) to 27 units (4 and a half units per floor). The permit was abandoned. In September of 1947, David Ashkenazy, trustee of the Ashe Realty Trust, applied for (and subsequently received) permission to convert the property from seven apartments and 10 maids rooms into 26 apartments. The permit probably was obtained by the Ashe Realty Trust in anticipation of acquiring the property. The work was never done, however, and 290 Commonwealth remained the property of the Commonwealth-Newbury Mortgage and Real Estate Trust. On June 29, 1957, the trust transferred the property to Byron Switzer and Francis Farrell, and on May 23, 1961, Francis Farrell acquired Byron Switzer’s interest. On June 5, 1961, 290 Commonwealth was acquired from Francis Farrell by Max Gopin, a real estate management executive. In October of 1961, he filed for (and subsequently received) permission to convert the property from seven apartments into 26 apartments. Max Gopin died in December of 1961, and on September 16, 1963, 290 Commonwealth was acquired from Max Gopin’s estate by Pierre Louis de Bourgknecht. On July 1, 1985, 290 Commonwealth was purchased from Pierre de Bourgknecht by Barry P. Winer, trustee of the 290 Commonwealth Avenue Realty Trust. 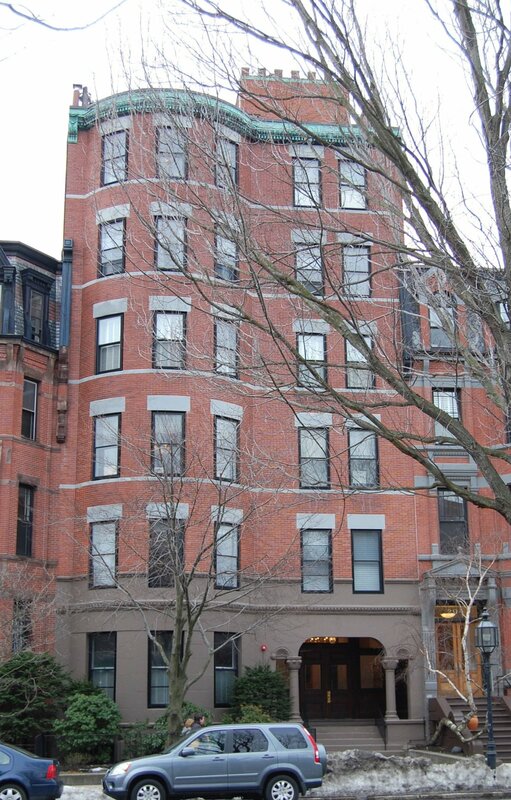 On July 8, 1985, Joseph D. Lilly, successor trustee of the 290 Commonwealth Avenue Realty Trust, converted the property into 29 condominium units, the 290 Commonwealth Avenue Condominium.